"Analogue Productions has followed up on their highly acclaimed series of 25 RCA Living Stereo SACDs with a smaller group of 9 Decca SACDs. ... 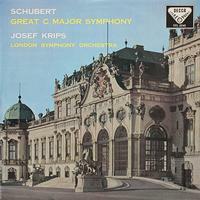 Recorded in 1958 in Kingsway Hall, Josef Krips' performance of Schubert's Ninth Symphony is not controversial. Tempos are consistently slow to middle of the road, emphasizing Schubert's melodies, which blend gorgeously with the open and airy sound." — Arthur Lintgen, The Absolute Sound, Feb. 8, 2019. Read the entire review here. The 1978 Penguin Guide to LPs wrote, "Josef Krips never made a finer record than this ... The performance itself has a direct, unforced spontaneity, which shows Krips' natural feeling for Schubertian lyricism at its most engaging. The playing is polished yet flexible, strong without ever sounding aggressive. In the two final movements Krips finds an airy exhilaration which makes one wonder however other conductors can keep the music earthbound as they do. The pointing of the trio in the scherzo is delectable, and the feathery lightness of the triplets in the finale makes one positively welcome every single one of its many repetitions. As a whole this reading represents the Viennese tradition at its very finest." This is one of the most respected and revered performances of Schubert's "Great" Symphony because of its combination of Krips' passion and classicism. Recorded in May 1958 in Kingsway Hall, London.